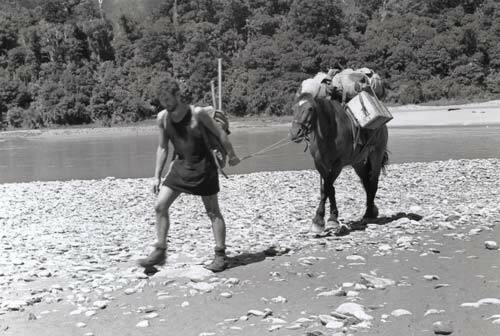 A young Fred Hollows helps to bring supplies up the Waiatoto River. In 1953 he was a medical student, working over the summer with the Forest Service. He later became a renowned eye surgeon, whose work is carried on by the Fred Hollows Foundation. As Ashley Cunningham’s story from those early days suggests, he was a cool customer in a crisis. Contributed by Ashley Cunningham of Napier. In 1953 I was working with the National Forest Survey at the Haast, based at an old farmhouse rented from a local family, the Nolans. Data on forests was collected from the coast up to the mountain valleys. Personnel for the project comprised a mix of forestry students, permanently employed, and university students working over the summer vacation. One of these was a medical student, Fred Hollows. When the work was nearly finished, Jack Holloway, a senior ecologist with the Forest Service, decided that seven of us should walk around the coast to Awarua Bay and out via the Hollyford Valley. It would be along trek – about eight days – and we were heavily laden. An old ex-army quad drove us over the Martyr saddle into the Cascade Valley. Walking down the grassy flats of the valley was easy, and we had the use of one of the Nolans’ huts that night – our last night of comfort until Big Bay. The next morning we burst through the flax-covered foredune to be greeted by squally rain and the Tasman Sea pounding a stony beach. We mostly walked along the beaches, which was hard going, as there was no sand, just loose round boulders sloping steeply to the sea. We also encountered occasional cattle, wild descendants, perhaps, of strays that had drifted north from Davy Gunn’s mobs in the Hollyford and Pyke. Mostly they would crash off in alarm. One day we were forced to walk along the bouldery beach because of impenetrable flax on the foreshore. Ahead was a small mob of cattle, watching us. As we drew level a young and active brown bull decided that we were intruders. He was going to chase us away. He trotted down the beach towards us, tossing his head aggressively. We had few places to retreat to. Seawards the beach shelved steeply to the pounding waves; on the other side the loose boulders leading up to the flax were impossible to run up. Someone shouted, ‘Drop your packs!’ We did this and retreated, hoping the packs would divert the bull’s attention. They didn’t. We had an old .303 rifle which we would take turns to carry. Fred Hollows had it at the time and, standing, fired a shot at the bull. The bull stopped, but only briefly. Then, with his blood up and his head down, he came on us even faster, helped by the downward slope of the beach. Unfortunately the rifle’s magazine spring was broken, and to reload you had to open the bolt, shake another cartridge from the magazine, thumb it in the chamber, and close the bolt. While we retreated, Fred stood in the path of the rapidly advancing bull, calmly conducting this tricky reloading procedure. He then aimed and fired again. The bull kept coming but suddenly the run became a stumble, and it collapsed a few metres from where Fred was busily struggling to get a third round out of the magazine. We picked up our packs and continued on our way.